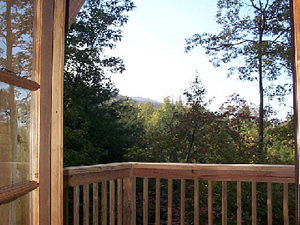 Description - Relax on the balcony with that novel you've been putting off while enjoying the view of the Unicoi or Starr Mountain ranges, and the pristine Cherokee National Forest. Or enjoy all the activities of a local mountain lake. You can bring the whole family to Monroe County, Tennessee for great mountain activities like swimming, boating, gold panning, horseback riding, whitewater rafting and kayaking, or exploring the many waterfalls, caves, hiking and biking trails in the area. Click Here for a PDF Online Brochure. The Tellico Plains and Coker Creek areas offer a clean, comfortable base to enjoy all your favorite outdoor mountain activities as well as visits to the many local art galleries and seasonal festivals. And don't forget the Cherohala Skyway. Our cabin is only a few miles away! "The ideal destination to seek if you're looking for mountain scenery without any trace of civilization." - Atlanta Journal-Constitution Travel Section (6/30/02) Also, major cities and attractions are never far away. Check out the fun at the Lost Sea and Sequoyah Museum near Sweetwater and Loudon, Dollywood in Pigeon Forge, and all the rides and attractions in Gatlinburg, about an hour or hour-and-a-half away. Chattanooga, Knoxville, Asheville and Franklin, NC are all within easy driving distance. Looking to buy property in the area? Great idea! Tellico Plains and Coker Creek are still pristine treasures waiting to be discovered, far from the pollution and congestion that has become prevalent in Gatlinburg and Pigeon Forge. Don't think you can afford to buy a vacation home? Timeshare rentals or resales are another great way to experience the best of the area. Unlike traditional hotels, these resort properties feature stand-alone cabins as well as mountain-lodge style accommodations that are located away from the crowds of Gatlinburg and Pigeon Forge, but still close enough to afford you the opportunity to explore these cities if you choose. 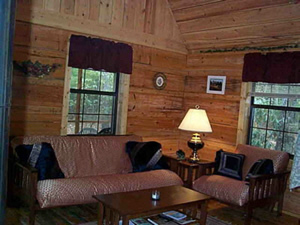 Our cabin has comfort and amenities you expect to find in higher-priced homes. 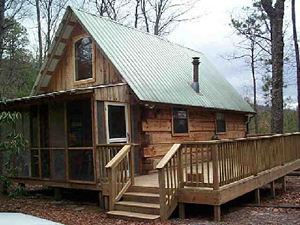 Want a cozy log cabin in the forest with deck, council fire? How about a balcony, outdoor spa, and BBQ grill? Or do you need a small family getaway where you can show your kids the wonders of Coker Creek Falls or Bald River Falls while you go fishing? Its all here. Clean, comfortable quarters, beautiful surroundings, and National Forest adventure. Check us out. 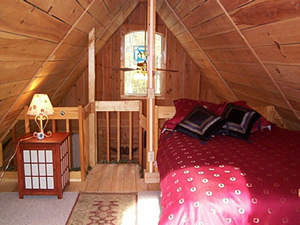 Our cabin is great for nature lovers of all ages! Book Your Stay Online Come visit us. Monroe County, Tennessee is the place you can relax and recover from the stress of life. Leave the city. Take a short stroll in the woods. The creeks, waterfalls, and wildlife are always there to soothe your nerves and comfort your wandering soul. We have much to offer a small family . . . or just the two of you. Reserve your spot today! !